I’m really not sure what to make of Grifter #1. I gave up relatively early on Jim Lee’s Wild C.A.T.s comic in the early years of Image, and never checked in with any of the various attempts to revive the series over the years. 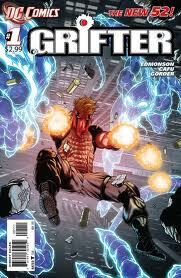 Grifter was one of the major characters—probably the most popular—on the team throughout its history, and is one of the major characters of the Wildstorm Universe that is now being incorporated into the mainline DCU during the New 52 relaunch. Despite my affinity for certain aspects of the Wilstorm universe and my general hope to see them merged effectively, I don’t have too much history with this character. I think he looks pretty cool, in a 90s sort of way, but if the original version of the character had powers beyond being an awesome soldier dude, I certainly can’t remember them. This version of Grifter? He’s kinda got powers. The comic opens on board a plane. Our “hero,” Cole Cash, is freaking out on a plane to San Juan shortly after takeoff. He’s hearing strange voices—alien voices—in his head. These voices seem to be following him and plotting his murder. To Cole’s surprise, one of the voices seems to be coming from the mind of the woman seated next to him, who indeed tries to kill him. Cole turns the tables and stabs her through the eye, killing her. As the passengers begin to freak out, Cole grabs a miniature liquor bottle and brandishes it in the air, pretending it’s a bomb. He demands that a flight attendant open the door, and threatens to blow up the plane if he does not. As Cole is about to leap from the open door, the evil voices all of a sudden seem to be coming from the flight attendant, who grapples with Cole as the two plunge from the aircraft to the ocean below. Following this tense opening, writer Nathan Edmondson cuts up the narrative, jumping back to “earlier,” showing the events leading up to Cole boarding the plane from the opening scene. Here we see Cole just after he has successfully double-crossed a criminal contact. He promises his associate Gretchen that he will be at the airport in 20 minutes, but just as he hangs up the phone, he is grabbed by a blue energy creature and hauled into a dark alley. Some time later, Cole awakens in a blue-hued room next to a glowing blue alien in a big tank. He’s tied to a table. During a scuffle as he tries to escape a mysterious warehouse, Cole begins to hear the strange voices in his head. They speak of a “disturbed transfer,” suggesting that enough of the alien’s consciousness may have bonded to him to hear other aliens, but not enough that he has lost control of himself. Cole kills a guy who is fully possessed by a blue alien and makes his escape, becoming a fugitive on the streets of New Orleans. He steals a hat and a red handkerchief from a rack outside a costume shop, and rushes to the airport. Then we’re back to the airplane for a montage of shots from the opening scene, ending with Cole plunging toward the ocean grappling with his alien attacker. He snaps the creature’s neck before they both smash into the water. Two hours later, Cole calls Gretchen, who says she has already returned to New Orleans. How’s that even possible, Cole says. I’ve only was out 17 minutes. Cole, Gretchen explains angrily, it’s been 17 days. Cut to the Pentagon, where a colonel is instructing Master Sergeant Max Cash, Cole’s brother, to find his wayward sibling. We learn that Cole is a former Delata Force operative, and thanks to his trick with the bottle on the plane, he’s now a wanted terrorist. Max is to hunt him down. Last, we come to a New Orleans cemetary, where Cole is sitting against a marble headstone. He says: “I want you the hell out of my head, demons. I want my seventeen hours back. But I dare you to find me. I dare you.” And then he puts on the traditional Grifter mask, and we’re off to the races. Or at least we will be, next issue. With relatively few supernatural elements and no superheroes to speak of, Grifter feels more like a potential television show than the other comics of the New 52 so far. The writing is interesting, if a bit light, and Cafu’s pencils are at least competent, if not exactly stunning. I will say that his final panel, showing Grifter in his mask, looks great. There are a few technical mistakes and confusing elements that put this comic on shakier ground than I’d hoped. The story is called 17 minutes. Grifter thinks the aliens kept him under for 17 minutes. Gretchen tells him it was actually 17 days. And then in the passage I quoted above, Grifter says “I want my 17 hours back.” Is the last reference a mistake? In the opening scene, when Cole is struggling with his seatmate attacker, we see three long-haired female characters in collared shirts: The seatmate, a stewardess, and a background character directly across the aisle. Colorist Andrew Dalhouse thought it would be a good idea to give all three of them reddish hair, and also colored both the seatmate and the identically dressed woman across the aisle with pink shirts! As Cafu attempts (somewhat awkwardly) to depict a scuffle in the aisle, the changing camera angles and similar characters make it harder than it should be to understand what is happening. Little things like this make it seem like the creative staff of this book aren’t quite ready for prime time. When doubled with the non-linear narrative, things veer dangerously close to a mess. It all holds together, barely, and if they can tighten the screws on this operation they might be on to something. Grifter provides an interesting crime noir angle to the New 52 lineup, so I’m probably willing to be more patient than I should be based on potential alone. 17 minutes, hours, or days, I’m going to be pretty surprised if this comic lasts 17 months. I’m rooting for it, but it’s going to have to try a little bit harder.